As I look at this stylish timepiece from IWC I feel a sense of calm. It has a gentle persona, perfectly at ease with its surroundings. Indeed, this may explain why it has been created in support of research and protection of the precious natural phenomenon, the Galapagos Islands. The archipelago of volcanic islands play host to a rich variety of plants and animals. Thanks, in no small part, to the wonderful work undertaken by the Charles Darwin Foundation, this fragile ecosystem is being protected for future generations. 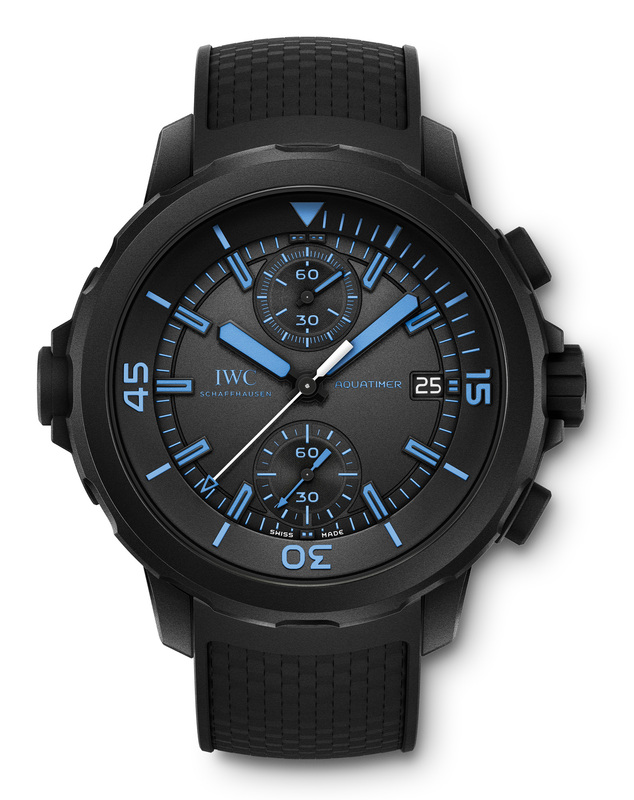 IWC supports the work of the foundation and has created two limited edition chronographs, the “50 years Science for Galapagos Islands” and the “Galapagos Islands”. Part of the proceeds from the sale of these watches will be donated to the Charles Darwin Foundation. 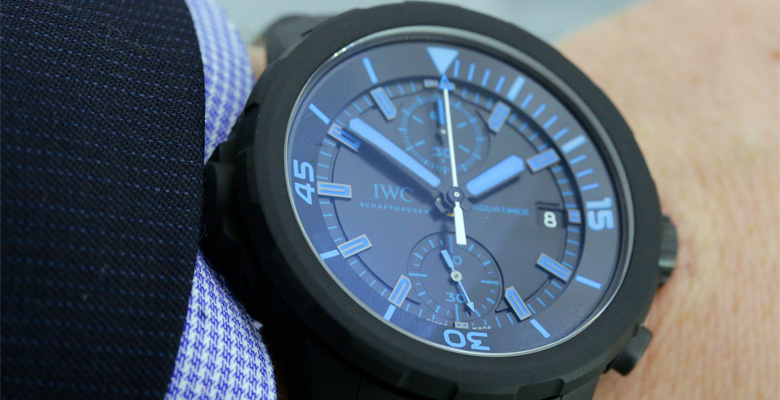 Earlier this year, IWC launched its range of Aquatimer models at SIHH and, in my opinion, each model is visually very appealing. Indeed, there are no “ugly ducklings” in the Aquatimer brood, just elegant swans, blessed with handsome lines. The bi-compax layout is the very embodiment of equilibrium, providing a visual metaphor for the balance sought by the Charles Darwin Foundation. The hour and minute hands are presented in an unusual, but highly engaging, vivid blue, said to resemble the feet of the interestingly named, Blue-footed booby, which is commonly seen on the Galapagos Islands. All dial details share the aforementioned blue hue, save for the central chronograph seconds hand and the numerals depicted on the date disc. These are presented in white and provide visual differentiation from their blue coloured neighbours. There is a distinct air of modernity with this watch. The predominantly black dial, case and strap ensemble exhibit a neoteric mien. The fonts used for Arabic numerals and the words “Schaffhausen” and “Aquatimer” are contemporary, reinforcing the youthful character of the timepiece. The only example of classicism is the brand’s nomen presented in text avec serifs. However, this latter detail seems perfectly in tune with the remainder of the watch and sits harmoniously on the dial. A small seconds display is positioned at 6 o’clock and includes a hacking seconds facility. A 60-minute chronograph counter resides at noon. 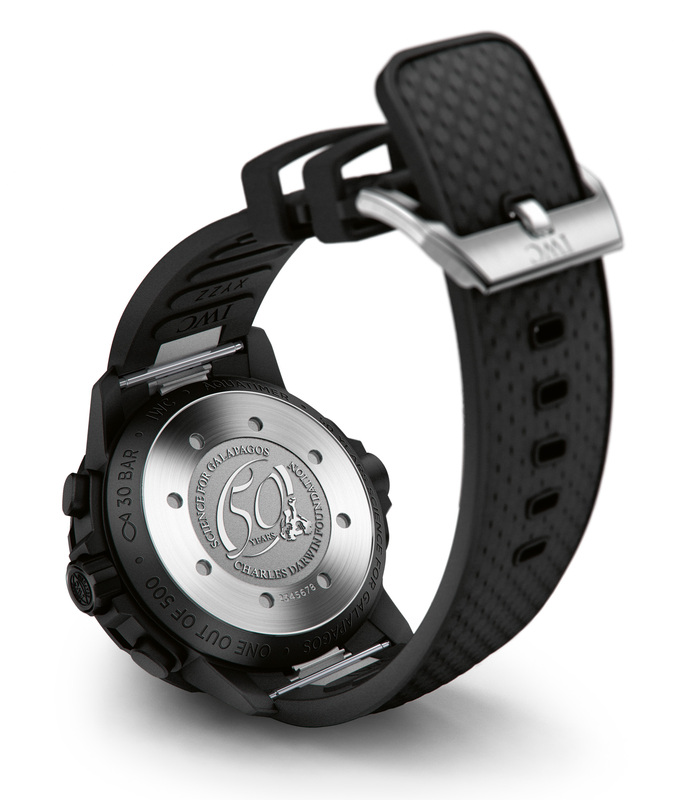 The case is constructed of rubber-coated stainless-steel and measures 44mm in diameter with a height of 17mm. This watch oozes masculinity and seems ideally suited to an action-packed lifestyle. Moreover, it is comfortable to wear with the short lugs enticing the textured rubber strap to encircle the wrist. The pushers, located at 2 and 4 o’clock, are elliptical in profile and have a pleasing action. The crown is marked with the IWC slogan, “Probus Scafusia”. 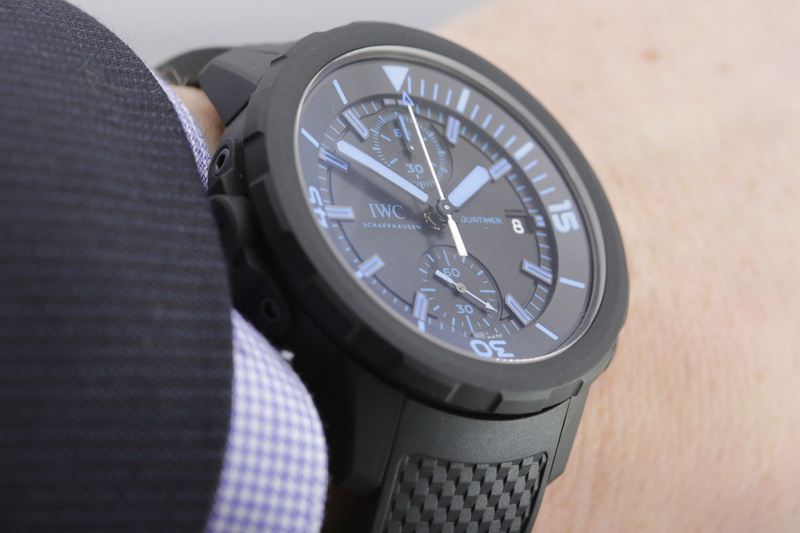 IWC has incorporated its ingenious mechanical external/internal rotating bezel with IWC SafeDive System. This intuitive system combines the benefits of an internal rotating bezel, protecting the mechanism from salt, water and soils, along with ease of adjustment, typical of external bezels. Should the bezel accidentally move underwater, diver safety won’t be compromised. Clockwise movement of the external bezel will be ignored and the internal bezel will remain unaffected. Counter-clockwise movement of the external bezel will cause the indicated start time to be stated earlier than the actual time, preventing the diver exceeding the planned period underwater. This is a true diver’s watch, water resistant to 30 bar (300 metres). However, like many men, I would not select this model for its underwater capabilities, but rather for its robust hewn-from-granite construction and dashing good-looks. Indeed, this is a watch infused with a substantial quotient of testosterone. IWC has respected tradition and fitted the model with a solid case back. I would have preferred to have seen the IWC-manufactured 89365 movement via an exhibition case back, but I know many purists will disagree. 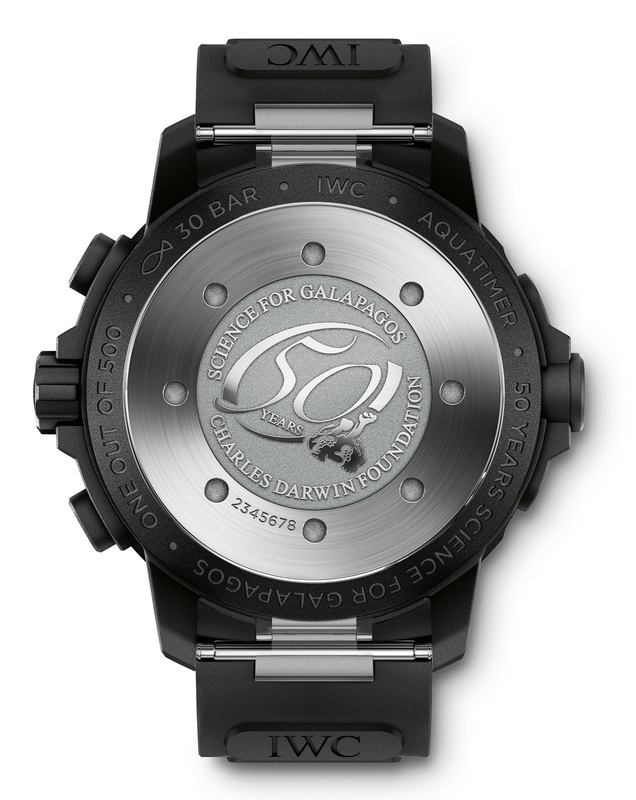 The case back is engraved with text stating, “50 Years Science for Galapagos” and “Charles Darwin Foundation”. In common with other models from this year’s IWC Aquatimer collection, the “50 years Science for Galapagos Islands” features the IWC bracelet quick-change system, allowing the owner to easily swap the rubber strap for alternative straps/bracelets without the need for tools. My only criticism is that IWC does not overtly promote a range of different bracelets or straps to choose from. Moreover, I feel that many avant-garde wearers would appreciate the chance to experiment with a plethora of different coloured straps to co-ordinate with clothing. This is a marketing opportunity that I am surprised the brand has not capitalised upon. The IWC-manufactured calibre 89365 is a self-winding movement with a frequency of 28,800 vph (4Hz). It contains 35 jewels and features an impressive power reserve of 68 hours. Interestingly, this is not a standard chronograph, but a flyback chronograph. This offers the wearer the facility to stop, reset and restart the stopwatch with one simple press of the pusher at 4 o’clock whilst the chronograph is running. It makes timing consecutive events simple. IWC has produced a horological pearl, which could readily entice any subaquatic explorer to dive and appraise its many attributes. It is a stunning watch with a very appealing appearance. Moreover, the dial is stylish, yet simple to read. The construction of the case is impressive. The tactile delight of the rubber coated case is fantastic and the pushers have a delightful action which encourages repeated use. The watch sits comfortably on the wrist and I particularly like the look of the textured rubber strap presented with a steel buckle. However, with a very user-friendly means of exchanging the strap I hope IWC launches a range of after-market strap and bracelet options. 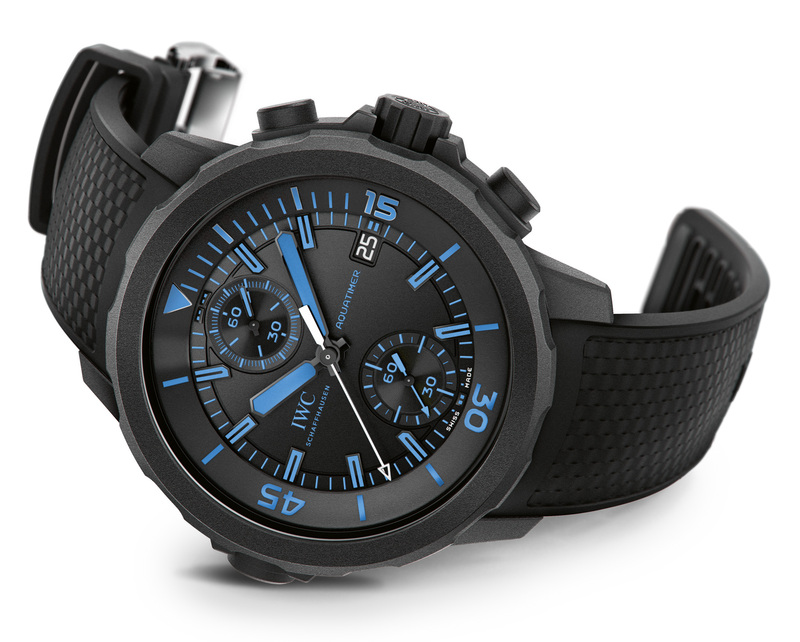 This IWC Aquatimer Chronograph Edition “50 years Science for Galapagos Islands” delivers a strong argument for acquisition. With only a limited series of 500 pieces, the black and blue colour scheme may also act as a metaphor for the stampede which could well ensue between collectors seeking the delights of this über-cool chronograph. Priced at $11,200 proceeds benefit the Charles Darwin Foundation. sapphire crystal to front and solid caseback. Functions: Hours; minutes; small seconds; date; chronograph. Movement: Calibre 89365, self-winding movement; frequency 28,800 kph (4Hz); 35 jewels; Power reserve 68 hours. Strap: Black rubber strap with stainless steel pin buckle. Angus Davies is a self-confessed horological addict. It was this passion for watch collecting which led to the launch of his own website, ESCAPEMENT, in 2011. He now regularly writes articles for other websites and magazines both in his native UK, mainland Europe and the US. These include printed titles such as Great Golf Magazine, iW Magazine, Deluxe Swiss Made.